Today, we have firmly positioned ourselves as one of the dominant Marjoram Essential Oil Exporters, based in India. Our Marjoram Essential Oil is derived from Origanum marjorana, using high technology machines. Marjoram Sweet Oil is highly appreciated for its warming actions that assist in reducing anxiety and stress. 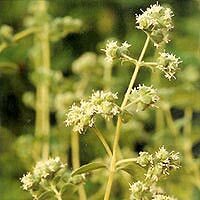 Moreover, Wild Marjoram Essential Oil is an excellent painkiller, thus it is highly beneficial in rheumatic pains, sprains, strains, etc.